It's election day in the good ol' US of A, and that means the rash of political tagging, graffiti (in the form of stickers and signs), and even projected images is coming to full head. 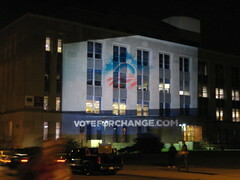 The above photo is of a large projection being done on the side of a University of Wisconsin-Madison building last night. This sort of thing isn't just being done on behalf of political campaigns, though. Projections, which don't physically damage property and aren't permanent, are becoming an ever-more popular way of showing art and getting messages out to a wider audience.